I first heard about the Green & Gold Community Garden, a joint project of the University of Alberta’s School of Public Health and the Faculty of Agricultural, Life and Environmental Sciences, a few years ago. All proceeds from the garden donations go to the Tubahumurize Association, in Rwanda, a not-for-profit organization that supports socially and economically marginalized women through counselling, vocational training, health education, and employment opportunities. I signed up for their weekly newsletter with produce updates, (the market is home to over 60 types of vegetables, herbs and flowers are grown at the garden, including many heirloom varieties), and yet, and for the past three seasons I have only made it out once during their volunteer-ran market hours on Tuesday evenings and Saturdays afternoons. This past Saturday I skipped out on my regular farmer’s market visit, instead opting for a drive to the Green & Gold Community Garden at the U of A’s south campus. When I arrived I found a combination of volunteers and visitors walking about, chatting and happily collecting veggies despite the chill in the air. There were boxes of tomatoes on the table, wheel barrows topped with squash, and piles of dirt-covered carrots, beets, and potatoes. It isn’t an official u-pick garden, but volunteers can walk through the garden to pick fresh vegetables, herbs and root vegetables. Bulk sales were in effect and I was invited to fill a brown paper bag with any assortment of potatoes, beets or tomatoes for $10. I stocked up on kale and spinach, carrots, shallots and even tomatoes. I even took the last of their Jerusalem artichokes, also known as sunchokes, so I could make some pureed soup. For $40 I walked away with five bags of produce and enough greens and squashes to keep me busy in the kitchen for some time. I even got a couple of sunflowers to spruce up my kitchen table. Visitors to the garden can also purchase handicrafts from Rwanda. Since 2009, the community garden has raised over $170,000 for Tubahumurize through the sale of produce from the garden, handicraft sales, and donations. 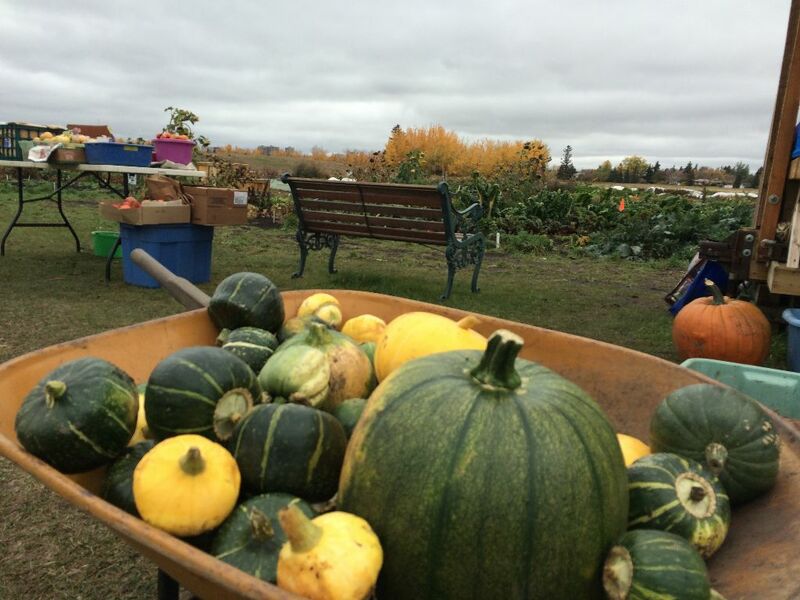 If you are looking to stock up on some harvest vegetables for your Thanksgiving meal, try visiting the Green & Gold Community Garden. For a map on how to locate the garden – click here. Previous PostTake me out to the ball game… and then up the CN Tower.